AverLogic Technologies, the video processing IC and specialty memory design company, will be presenting a live demonstration of their Power-line Digital Home along with comprehensive solutions, including ‘H.264 HD A/V streaming over Power-line’, ‘iPod and 192KHz Audio Streaming over Power-line’, and ‘IP Camera over Power-line’ at the CES 2009 show. 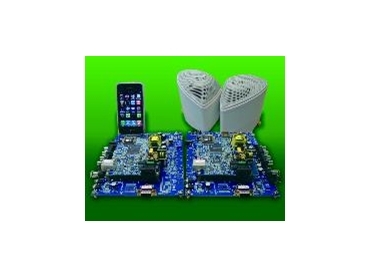 AverLogic Technologies’ products are available from GLYN High-Tech Distribution . Other AverLogic Technologies’ expert video solutions on display include the fast and high density ‘Full HD Video FIFO Memory’, 4-CH Multiplexer, PoE + Network Video Server/IP Camera module, MPEG4/2/1 USB Grabber and Digital/Analogue OLED/LCD Display. The major highlight in the AverLogic Technologies’ booth will be the H.264 HDMI 1080p HD A/V Streaming over Ethernet or Power-line module, consisting of a transmitter (TX) and a receiver (RX). It allows H.264-compressed HD (up to 1920x1080 at the frame rate of 24p or 60i) video and audio digital signals to stream from the A/V equipment, such as Blu-ray Disc player, video game console like PS3, HD DVD or STB, to the compatible HDTV. The combination of H.264 CODEC, Media Network Controller, and PLC technologies make the video and audio content stream smoothly (data size 20M to 8M) and widely at home. One TX in living room can deliver signals to 3RXs in 3 rooms. The RX can be easily integrated into the HDTV through HDMI and it avoids the hassles of wiring job between the A/V transmitting and receiving equipment. It basically supports one source (HDMI), and optionally supports up to five sources (HDMI x 4 + Y/Pb/Pr x 1), which can all be controlled by the TX-included remote at RX side. iPod and 192KHz Audio Streaming over Power-line will be the second highlight. The new Audio reference design incorporates cutting-edge audio processors and power line communication technologies to allow CD-quality digital audio data to transport over the power line. Both of the reference designs, streaming iPod and 192KHz audio over power line, can be easily adapted to a variety of audio system applications that send and receive audio content from any source anywhere in a home. The performance of this solution provides good sound quality delivery as if it is delivered through the top-end audio cable. A configurable latency time can be as low as 10ms, meeting the high-end stereo system criterions and an audiophile’s expectations. An iPod docking connector is also incorporated on board with full function control supported, including the remote control IR feedback from the receiving unit. The reference design guarantees a stable audio streaming by using the proprietary Dynamic Bandwidth Management (DBM) technology to ensure a smooth streaming quality, even over the noisy power line environment. One would see a PLC outdoor speaker live demo in the AverLogic Technologies’ booth. AverLogic Technologies will demonstrate IP Camera over Power-line. IP camera is a stand-alone device that does not need a computer for normal operation. It transmits real-time video/audio signals over existing power line, so the IP Camera and signal receiving monitor can be anywhere beside a power socket at home. This IP camera module transmits the configurable MPEG-4 compressed video and audio streaming data with TCP/IP protocol through not only Power-line, but also Ethernet, or WiFi to receiver. Therefore, one can also use a computer to browse the camera IP address and watch the real-time video and audio at home in office or any other place with Internet access. These Audio/Video streaming solutions takes the advantage of existing Power-line infrastructure in the home, so there is no need to worry about the distance and connecting the cable between A/V transmitting and receiving equipment. Users can simply plug and play to enjoy high performance audio and home theatre at anywhere in the home.